Brian (freshman) and Steven (senior) Ta, first-generation accounting students from Chicago, Illinois. What does a contact team sport such as lacrosse have in common with accounting? 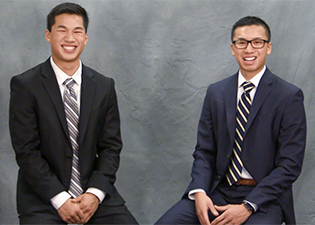 The answer is the dedication and loyalty of two first-generation accounting students, 21-year-old Steven Ta and his 18-year-old brother, Brian Ta. With their extraordinary passion and drive, the Chicago natives have touched the lives of many of their fellow classmates – and SIU College of Business faculty and staff members, too – even as they have left their individual marks on the local community in Carbondale. Both have become an integral part of the Saluki family. After Brian Ta followed in the footsteps of his big brother a couple months ago, they aired their thoughts on brotherhood and their SIU education while offering some valuable words of wisdom for prospective SIU students. Although he initially considered attending Western Michigan University, the 18-year old Thompson Point resident opted to become a Saluki instead. “I already felt involved on campus before I got here,” Brian Ta said. The very same feeling brought his big brother to Carbondale three years ago. Fast forward to 2015, and the senior accounting major is now wearing multiple hats. He serves as president of the Accounting Society, vice president of Beta Alpha Psi, student ambassador for the Illinois CPA Society and past president of the lacrosse club. The latter, in particular, is a source of pride and accomplishment for the budding Deloitte representative. “When I got here, they previously had four club members, and I built that program up to about 30 students,” Steven Ta said. Among those students is his little brother, who was on the lacrosse travel team in high school and planned on going to college for lacrosse before he caught the same passion for accounting that Steven Ta already possessed. “I remember taking my first test and thinking, ‘Oh, my gosh, this is accounting and it’s so much different – and something that normal people don’t do in their everyday life,’ ” Steven Ta said. Back then, the senior accounting major had no idea what impact his decision would have for himself, let alone his little brother and his entire family in Chicago. By being the first in their family to make it to college, the Ta brothers have experienced firsthand the perks and challenges of being first-generation students. Remembering his own struggles at the beginning of his college career, Steven Ta strongly encouraged his little brother to find his own path through college. Brian Ta took his brother’s advice to heart. Three months into his freshmen year, and he is a participant in the mentoring program – and he’s also involved with the Lacrosse Club, the Illinois CPA Society and Accounting Society, and a proud member of Alpha Tau Omega. Another highlight of his first year as a Saluki was the etiquette dinner hosted by the College of Business specifically for freshmen. When he returned home for his first fall break, those table manners drew a lot of attention. Despite attending the same university and sharing a passion for accounting, the two rarely talk about school or their major when they travel back home to be with their family. “At home, we talk about sports and girls,” Brian Ta said. When the brothers are not busy pursuing their professional and educational goals – including running a joint business they have had since high school, which consists of buying and selling sneakers and textbooks online – and trying to make it into one of the four big accounting firms, the young entrepreneurs are likely to be found in the weight room of the SIU Recreation Center, in lacrosse practice, or at one of their favorite eateries: Buffalo Wild Wings, Thai Taste and Fujiyama Restaurant.